If you aren’t familiar with Dean guitars, they are heavily associated with hard rock or heavy metal type of playing, I think their popularity has kind of waned in the last 10 or 15 years – you don’t generally really see a lot of Dean guitars around anymore, at least not in my area anyway. 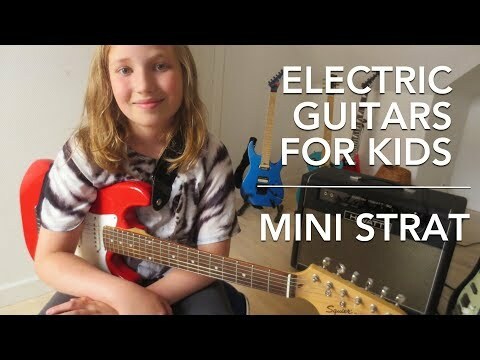 But since there really aren’t a lot of great quality electric options for kids, I wanted to have a look at this mini to see if it might be a good alternative. This is a great looking guitar. It has a laminated basswood body and a solid maple top maple neck with a rosewood fretboard and all of the hardware is chrome. You can only get it in classic black with a high gloss finish that is really nicely done. It has 22 frets even at the 25.5-inch scale. It also comes with dot inlays, die-cast tuners, and bolt on construction. The headstock say ‘Dean’ in cursive and is a decent shape. On the Dean Guitar website it does mention that this model is perfect for kids and (people with smaller frames). So it is designed for that purpose. The overall feel of this instrument is very solid. It is supposed to be setup by the Dean technicians before shipping to be virtually playable right out the box, although this isn’t necessarily the case. 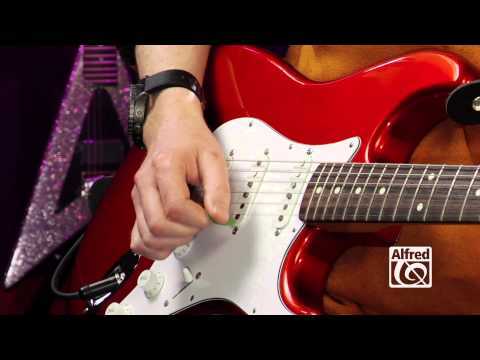 You may have to do some minor adjustments, depending on your level of knowledge of how guitars should feel and play. It does come with a couple of Allen keys and instructions for adjusting the truss rod and bridge saddle heights, if you feel comfortable doing that or you can just take it into a music shop and they can do a setup for you really easily if you think it isn’t sounding or the action is too high or low for you kids to be able to play it properly. When you first get this guitar and are trying it out before you hand it over to your child, you might wonder about the sound a little bit. Short scale models have a slightly different sound than full sized. It isn’t a terrible sound or anything it is just not as full, so be aware of that and don’t expect it to sound the same as other full sized electric that you may have. Having said that, this guitar has a great clean sound, the intonation is decent out of the box and you can set it easily with the “tune-o-matic” bridge if it isn’t quite right. Getting the intonation right on short scale guitars can sometimes be a bit of a process, but this one isn’t too hard to fix (an easy way to do this is to just put on some heavier gauge strings). As with a lot of budget or lower priced guitars, some corners are cut. With this model it would have been nice to see some higher quality tuners on it. These die cast tuners aren’t terrible to the point of being a deal breaker, but they could definitely be improved. The quality of this instrument is very impressive for the price that you are paying. The construction is pretty good for a made in China guitar. Some of these newer Chinese made models are really getting pretty decent, kind of making it hard to be a snob about the workmanship of Chinese manufacturing. The paint job is fantastic and the finish on the neck is really slick. Of the models that I looked at, I couldn’t see and sharp frets or sharp edges on the fingerboard. This guitar suffers from some of the standard problems of most short scale instruments. Basically they are a little hard to get the intonation right and you will have to retune it frequently. To me this isn’t a huge issue, especially if it is a kid playing, since the more practice that you get tuning the better, in my opinion. However, if you have a child who is easily frustrated that may be something to keep in mind. There have also been a few reports of the 1/4 locknut washer for the output falling off, so you may need to get that tightened up at a music shop or do that yourself if it is loose. This is a very impressive little guitar for the price. It is a bit cheaper than the Mikro and around the same price as the mini Strat so it is worth a look if you are deciding between the other two options. You are getting really good quality and great sound for a pretty good price. Unfortunately it only comes in the one color (black) but that black option is a great looking instrument and most kids would be pretty happy with this guitar. Copyright © 2019 Electric Guitars For Children. All rights reserved.